The America – as she appeared in 1851. To the initiative of the Earl of Wilton as Commodore of the Squadron was due the first international yacht race, in which the historic America captured the trophy offered by the Royal Yacht Squadron in 1851. As this event, and the subsequent history of the cup, have been the subject of innumerable essays, it may be dealt with briefly in these pages. Nevertheless, this first international race had a marked effect upon British yacht­ing from that time onward. ‘7, GROSVENOR. SQUARE, LONDON, ‘February 22, 1851. ‘Understanding from Sir H. Bulwer that a few of the members of the New York Yacht Club are building a schooner which it is their intention to bring over to England this summer, I have taken the liberty of writing to you in your capacity of Commodore to request you to convey to those members, and any friends that may accompany them on board the yacht, an invitation on the part of myself and the members of the Royal Yacht Squadron to become visitors of the clubhouse at Cowes during their stay in England. For myself, may I be permitted to say that I shall have great pleasure in extending to your countrymen any civility that lies in my power, and shall be very glad to avail myself of any improvements in shipbuilding that the industry and skill of your nation have enabled you to elaborate? ‘I regret that an accident prevented the reception of your letter until after the packet of the 12th had sailed. I take the earliest opportunity offered to convey to the gentlemen of the Royal Yacht Squadron and to yourself the expression of our warmest thanks for your invitation to visit the clubhouse at Cowes. Some four or five friends and myself have a yacht on the stocks which we hope to launch in the course of a few weeks. Should she answer the sanguine expectations of her builder and fulfil the stipulations he has made, we propose to avail ourselves of your friendly bidding, and take with a good grace the sound thrashing we are likely to get by venturing our longshore craft on your rough waters. I fear the energy and experience of your persevering yachtsmen will prove an over­match for the industry and skill of their aspiring competitors. Should the schooner fail to meet the expectations of her builder, not the least of our regrets will be to have lost the opportunity of personally thanking the gentlemen of the Royal Yacht Squadron and yourself for your considerate kindness. The designer of the America was George Steers, a son of a Devonshire shipwright, who learned his trade in our own Royal Dockyard at Devonport, and went to America in 1819; and the builder was Mr. William H. Brown, who had undertaken to build a schooner that should outsail any other vessel at home or abroad, and to make the purchase of her contingent upon her success. Thus, briefly, we have the chain of events leading up to the historic race of 1851. 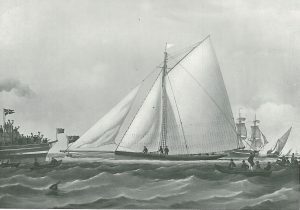 The America was sailed in trial races in American waters against Commodore Stevens’ yacht Maria, but she failed to beat that vessel, and Mr. George Schuyler made an offer to purchase her for $20,000, which was accepted. 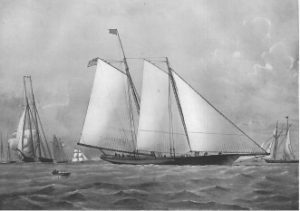 She sailed from New York on June 21, 1851, for Havre, where she was fitted out, and arrived in the Solent on July 31, her advent creating no small amount of excitement. From the fact that this challenge was not accepted it appears that America’s peculiarly fast appearance had frightened British yachtsmen, and on August 9 Commodore Stevens issued a challenge to sail the America against any cutter, schooner, or vessel of any other rig of the Royal Yacht Squadron’; and intimated his willingness to ‘stake upon the issue any sum not to exceed ten thousand guineas.’ This challenge was not accepted, and the America was entered for the Royal Yacht Squadron Regatta of August 22. The iron Schooner Yacht Titania 100 tons. Built by Messrs. Robinson and Russell at Millwall. 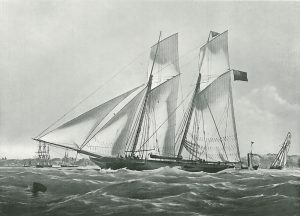 The first individual match was arranged between the America and the Titania, 100 tons, owned by Mr. Robert Stephenson, for £100, over a course 20 miles from the Nab Light and back. This match was sailed on August 28, after the Squadron race, and the Titania was beaten by 47 minutes. The tonnage of Titania was 100; the America was registered as 170, and there was no allow­ance of time. Another challenge to sail against the America was issued by Mr. Woodhouse, owner of the Gondola, from Cowes round the Eddystone Lighthouse and back to Cowes, but was not accepted. Volante, 48 tons. Winning the Grand Challenge Cup, Value 200 Guineas, May 14, 1852. Built in 1851 by Harvey of Wivenhoe. There was no time allowance for difference in tonnage. The yachts were moored in a double line for the start, and at 9.55 the first gun was fired, when they proceeded to set their canvas. The start was made at 10 a.m., the America, curiously enough, being the last to make a move. They sailed to the eastward with a flood-tide and a light following breeze. Gipsy Queen went off with the lead, followed by Volante, Constance, Arrow, and the rest, whilst the America, with all lower sail, a jib-headed topsail and flying jib, reached along the shore in a weather berth. At Noman Buoy led Freak by 1 minute 20 seconds, Aurora by 1 minute 30 seconds, Gipsy Queen by 1 minute 45 seconds, America by 2 minutes, Beatrice by 2 minutes 15 seconds, Alarm by 2 minutes 20 seconds, Arrow by 3 minutes, and Bacchante by 3 minutes 15 seconds. All the yachts, with the exception of the America, went round the Nab, for the instructions were conflicting. She had the lead when, in a freshening breeze, she carried away her jib-boom off Sandown Bay. This, however, was a decided advantage on the wind, but the rest soon after began to come up on her. Off Ventnor America was about a mile ahead of Volante, which led the British fleet, and here Arrow got ashore, and Alarm stayed by her to render assistance. Volante also retired with a sprung bowsprit. With the race well in hand, America rounded St. Catherine’s and arrived an easy winner at 8.37 p.m., with Aurora next at 8,58, Bacchante 9.30, Eclipse 9.45, and Brilliant 1.30 (a.m. Sunday). Such was the beginning of the long history attaching to the America Cup. It should be noted that the mistake has been persistently made that this cup was presented by the Queen. It was one of the ordinary prizes of the Royal Yacht Squadron. In the light of modern experience, one can find but little merit in a vessel of 170 tons beating another of only 47 tons by 21 minutes over a course of 53 knots, but yachtsmen are not so much concerned with the manner in which the historical trophy was won as with the extreme difficulty of winning it back. Even if one could succeed in the thankless task of showing that America was totally unworthy to win the prize, one cannot by any means disguise the fact that it has been defended with exemplary skill. Much has been said of the superiority of America’s model, but whilst admitting her to have been a well-designed sea-going vessel for her period, most of her great speed must be attributed to the excellent set of her sails. These were of cotton, and were cut to sit flat, whereas our yachts had heavy flax canvas of most pronounced bagginess.